Successfully Added Magnetic Levitating World Globe to your Shopping Cart. World globe with magnets on both poles for a free floating effect. This is a perfect item for turning any bland looking desktop into a great symbol of new world unity. 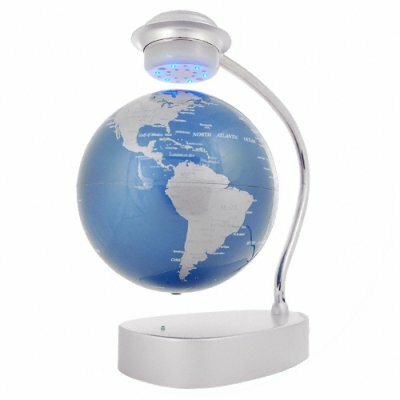 This beautiful modern world globe features an attractive silver display stand and blue LED lights that shine down on the floating globe so it looks good both day and night. With a gentle spin the globe will keep turning for hours. Simply plug the stand in, use the spacer to correctly place the globe in the center, and you will have your own free floating and fully rotating desktop companion and reminder of the brave new world we are in. A super low wholesale price is available for even one item, but buying in bulk means that you will save even more and increase your re-sale profits on your Amazon Shop, EBAY, UBID, etc. World Globe Floating In Metal Magnetized Holder.